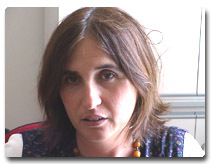 Adriana Belletti is Professor of Linguistics at the University of Siena. She has been a student and then a researcher at the Scuola Normale Superiore of Pisa, a visiting scholar and research affiliate at the Department of Linguistics of MIT. She has taught at the University of Geneva, in various international summer institutes, e.g. LSA/New York, Glow-Girona, ALI-Brisbane-Australia, Glow-Barcelona; in various linguistics departments and research institutes, e.g. UCLA-USA, UFSC-Florianopolis-Brazil, University of Paris-7, DEC-Ecole Normale Supérieure, Paris. She is a member of the editorial board of Linguistic Inquiry, MIT Press; she has been in the scientific committee of various international conferences and workshops - recently, GALA2005-University of Siena; Latsis Colloquium 2006-University of Geneve, 35th IGG 2009-University of Siena. She has been a member of the European COST A33 Crosslinguistically robust stages of children’s linguistic performance. She is the national coordinator of the project founded by the Italian Ministry of Research/FIRB (Fondo Italiano per la Ricerca di Base) on Fundamental research and the Italian language: Documentation, monolingual, bilingual and L2 acquisition, conception of multimedia products. She is the coordinator of various a Socrates-Erasmus programs between the University of Siena and the: Université de Genève; Autonoma University of Barcelona; University of Stüttgart; University of Edinburgh; University of Oldenburg; Université de Tours. Her research focuses on theoretical comparative syntax, comparative studies in language acquisition and pathology. “Aspects of the low IP area”, in The Structure of CP and IP, L.Rizzi ed., 16-51, 2004, Oxford University Press. "Answering strategies. A view from acquisition", in Romance languages and linguistic theory 2005 (S. Baauw, F. Drijkoningen and M. Pinto eds. ), Amsterdam/Philadelphia: Benjamins Publications, 2007, 19-38. The focus map of clefts: Extraposition and Predication. On Fin: Italian che, Japanese no, and the selective properties of the copula in clefts. Relative Clauses from the input: syntactic considerations on a corpus-based analysis of italian. Intervention and Attraction. On the Production of Subject and Object Relatives by Italian (young) Children and Adults. Ways of avoiding intervention: Object relatives, Passive and Control. Pronouns and the edge of the clause..
Acquisition meets comparison: some notes. Relativized relatives: Types of intervention in the acquisition of A-bar dependencies. Notes on Passive Object Relatives. Answering strategies: New information subjects and the nature of clefts..
Answering strategies. A view from acquisition. Extending doubling to non local domains: complete vs partial copying + deletion and related reconstruction issues.. Kinds of evidence for linguistic theory. Answering with a cleft: the role of the null subject parameter and the vp periphery. Extended doubling and the VP periphery. Aspects of the low IP area. Subject inversion in L2 Italian. Adult L2 acquisition of Italian clitic pronouns and "Subject inversion/VS" Structures. La frase comparativa in italiano antico. ’Inversion’ as focalization and related questions.